Books and other literature have historically played a critical role in social justice movements, and the same is true for animal advocacy and vegan education. There are some simple ways that you can help us increase our distribution to a wider audience, spreading the vegan message, while also gaining greater personal access to our books. First, it is a great idea to ask your local bookstore to carry our books. Most stores are happy to oblige such requests regardless of location, making the books more accessible to you and others. The same approach can be used with libraries, by filling out a form on the library’s home page or in person. 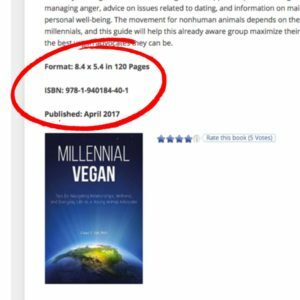 This is a great way to get vegan-themed literature in front of those who may not have yet made the connection, as well as increase access to other vegans who may not have the financial means to purchase books. An added bonus is that you get to read the books for free! Most people are not aware of the fact that local libraries all have allotted budgets for which they have the ability to order books at their own discretion. So if those using the library show demand for particular books, the library staff will order them. It’s pretty simple! We have tried to make these book activism strategies easier for you by listing all of the details on each individual book’s page. See below.